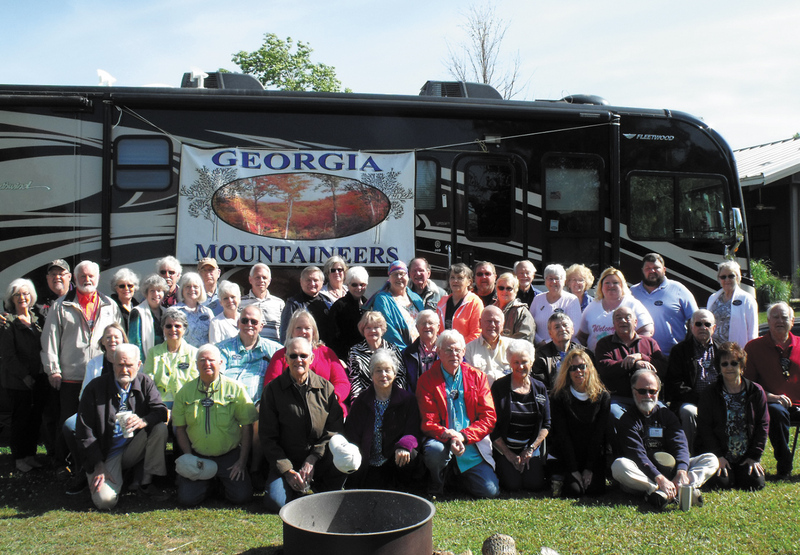 Georgia Mountaineers chapter members staged this group photo during a rally in April 2018. So Cool mountains and warm friendships have marked this chapter’s past 25 years. When the Georgia Mountaineers chapter was chartered in 1993, members came from the north Georgia area. However, since most of our summer rallies are held in the Smoky Mountains, we met many retired RV owners who spent the summer months camping in that cooler climate. Many of them were from southern Georgia, Florida, Alabama, the Carolinas, and Tennessee. Then, we invited these folks to participate in our rallies. As a result, we now have members from all over Georgia and the adjacent states. Our rally season starts in March or April and continues through November. We meet primarily in north Georgia, with travels ranging to Alabama, Tennessee, and North Carolina. We also visit coastal areas such as Myrtle Beach, South Carolina; Brunswick, Georgia; and the panhandle of north Florida. Rallies typically run from Wednesday to Sunday, usually on the third week of each month. The rally agenda generally has open periods, so you can wander off at your own leisure to visit sites in the area. The schedule may include a cookout or potluck. Additionally, for many years, one of our cookouts has been a delicious low-country boil. Since most of our rallies are in the north Georgia area, we often get to enjoy springtime in the mountains. Our autumn rallies coincide around the height of leaf-peeping season. Attendance at our rallies usually ranges from 15 to 25 vehicles. Some of us like to eat out; go shopping, antiquing, and sight-seeing; sit around the campfire and tell tall tales; and play games such as hand and foot, Fast Track, and dominoes in the evening. Biking, hiking, golfing, or other specific interests can be catered to at some rally sites. If we are in a city that has a trolley, bus, train, or boat tour, those may also be added to the rally agenda. Sometimes we tour a factory, winery, home, or historical location. While most of our members are retired, in keeping with the FMCA tradition we welcome RVers of all ages — children and grandchildren included. Our Christmas luncheon in December is usually at a historical restaurant in the north Georgia area or at a state park lodge. During that time, we support food pantries and needy families, and give Christmas toys and gifts to children enrolled in various community support programs. For our 2018 rally schedule and more information, see our website at www.georgiamountaineers.org. Or, contact me, Ted Barrett, at bears1031@gmail.com; (706) 889-2004. In addition, you also may reach chapter president Ed Durrence at tdurrenc@yahoo.com; (678) 200-5819.